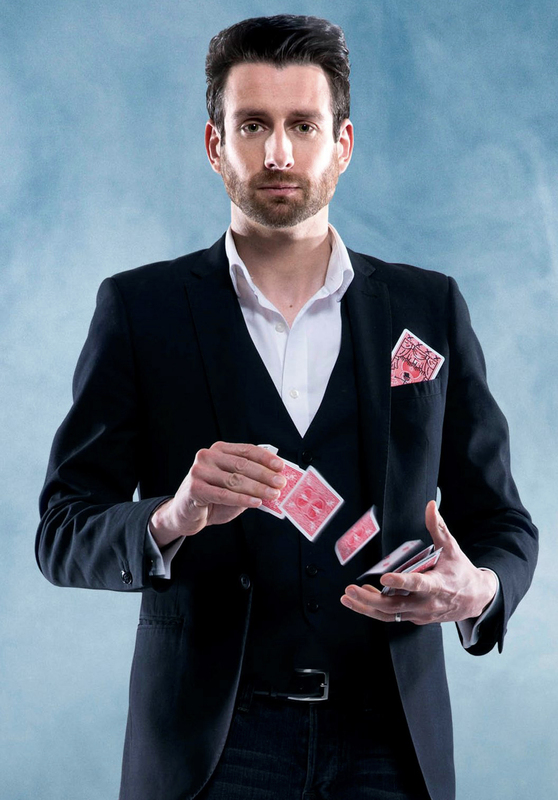 PREPARE to be amazed as Britain’s best new magician Jamie Raven pulls off the most incredible tricks before your very eyes – and he’s coming to St David’s Hall! Fresh from headlining a record-breaking West End spectacular The Illusionists, Jamie kicks off his debut tour in style with a mesmerising show at the National Concert Hall of Wales on Thursday 16 June. It’s been a whirlwind 12 months for Jamie since finishing runner-up on last year’s Britain’s Got Talent. Yet it wasn’t just Simon, Amanda, David and Alesha that he wowed, but the whole country! Jamie has been busy perfecting his craft for over a decade as a hobby, and deservedly the eyes of the nation are now on him thanks to appearances on programmes as diverse as Bruce Forsyth’s Hall of Fame Christmas special to the BBC’s coverage of the FA Cup. It’s not just Jamie’s spellbinding tricks that will captivate audiences either; it’s his charisma and unassuming personality that captures hearts. His opening audition on Britain’s Got Talent has now been viewed on YouTube over 15 million times, and seen by over 90 million people worldwide on Facebook. Even the likes of Ashton Kutcher, Ne-Yo and Drake have declared themselves fans online. His performance left Simon Cowell gasping: “I now finally believe in magic!” Perhaps you’ll have a similar reaction to Jamie Raven’s jaw-dropping live show at St David’s Hall! Tickets are priced £18.50 (plus an additional £2.95 Ticket Service Charge per transaction and an optional 95p postage fee). £2 off per ticket for standard concessions. How has your life changed since Britain’s Got Talent? I was very lucky to be able to do something I loved for a living for ten years before the show and I was performing at various social and corporate events, which was amazing. The biggest thing for me since the show is being invited to perform in theatres and headline The Illusionists at the Shaftesbury Theatre, which went on to break box office records for a limited engagement. It’s their most successful limited engagement ever, which is incredible, and now that’s lead to me doing my own tour. Britain’s Got Talent has raised my profile and now I get to do my own show and be invited to lovely parties and a lot more things. What are your fondest memories of doing the show? My favourite part was probably when it was all done, it was the final and I’d finished performing, I was standing in front of the judges’ table and they all stood up and the audience was going nuts. I knew it was over and whatever happened, to have made it that far was just amazing. I’d been working on it for almost a year – planning what to do in the audition, doing the audition itself, then you have to wait a number of months before you do the live shows and all that has to be planned. It’s something I’d been thinking about every day since I decided to do the show so it was a relief that it was all over and that it had gone well and I managed to get a standing ovation at the final. And what have been your proudest moments since then? Being asked to headline a show in the West End for anybody who performs for a living is what you aim for. It’s the reason I did Britain’s Got Talent – to raise my profile and get to perform in theatres and for more people than I’d ever done before. So doing The Illusionists was amazing and I was also invited to perform for Sir Richard Branson to mark Virgin Atlantic’s inaugural flight to Detroit. Then I was invited on the BBC programme Bruce’s Hall Of Fame and got to meet Bruce Forsyth, who is obviously a legend in the entertainment industry. And now I’m doing my own tour. That’s another biggie and I do bits and bobs for the BBC’s FA Cup coverage, doing tricks for the players – which is pretty awesome. So many wonderful things have happened off the back of Britain’s Got Talent. I wake up every morning and I can’t believe it. I go to get a pint of milk and people are asking for a photo with me. I’m the same guy doing the same stuff I’ve been doing for ten years professionally – and learning for about 20 years in total – and to be recognised for the hard work you’ve put in is incredible. After every show of The Illusionists there’d be crowds of people wanting to say hello or have a photo… I don’t know if it’ll ever sink in, to be honest. You’re going on tour solo for the first time. What are you most looking forward to about it? As with The Illusionists, it’s amazing to be able to perform in theatres because it gives you the best showcase for any performance art. The Illusionists was great and I was part of a bigger show, which was awesome, but the thing I’m looking forward to the most is the fact people will be coming to see me. They’re going to see the culmination of 20 years of my life and I’m in such a privileged position to be able to share all that and my take on the art that I love. Myself and a team of people are writing it and we want to tick all the boxes so there’ll be some close-up stuff that people might be familiar with from Britain’s Got Talent, some audience participation, people coming up on stage with me, grander-scale illusions and hopefully a lot of laughs along the way. Will you be going places you’ve never been before? There are some places I’ve been to and many I haven’t. I’ve been to a couple of the theatres closer to where I live in Berkshire, so the ones around the South East I’ve been to before but it’ll be interesting going to all the places I’ve never been to. What are the challenges of doing magic on stage? It’s easier to perform on stage. When you’re performing live on stage as a magician it’s better because people can’t pause and rewind it. Magic works because fundamentally you’re misdirecting people’s attention so when it’s live it’s fantastic because you know people are watching you and you only have one chance. They don’t know what you’re going to do so they don’t know where to be looking at what time. With TV it’s amazing because if you just stand there and the camera’s looking at you then you can show people at home exactly what you want them to see. The difficulty with performing live is that you want to stage it so that everybody can see everything, so even the person at the back of the room can see what the person at the front is seeing. That brings its own challenges; if you’re doing something that’s not suitable for a screen you’ve got to stage it and light it so that everybody can see everything. Can it ever go horribly wrong? [Laughs] As with every live performance anything can go horribly wrong but the reason magic works is that you have the element of surprise so hopefully the audience isn’t aware of where you’re going when you start something. If anything were to go wrong I’d be aware of it long before the end of the trick and I’d just change the trick so it would end differently. That’s where experience comes into it. When you plan routines you have to bear in mind ‘What’s the worst thing that could happen and how could it go wrong?’ and then you think ‘If it was to go wrong how would we get out of it and fix it?’ You prepare plan A, which is exactly what you want to happen in an ideal world and it does most of the time, but you also prepare your plan B, which is where you imagine if everything was to go wrong what could you do. What’s the one thing you couldn’t be without on the road? Diet Coke. People say ‘Have a Coke’ and I’m like ‘Diet Coke please’. They ask ‘Are you watching you’re figure?’ but it’s nothing to do with that, it’s about the taste. It tastes different. People don’t think it does but I promise you it does. I probably drink far more of it than I should. It hasn’t got sugar in it but it’s got all the other chemicals they use to replace sugar, but we’re all allowed one poison. What are your pre- and post-show rituals? Post-show I like to pack everything up. I also get changed as soon as I can. If I’m wearing a suit or something I don’t find it very comfortable. I wear suits because they look smart but I like to get changed as quickly as I can after a show. Before a show, I don’t have OCD or anything but I’m always checking all the props. If, for example, I’m doing a trick with some envelopes I’ll check them and I’ll check them again, I’ll go away for five minutes, check them again and I know they’re fine but I’ve got this thing in me where up until literally the second before I’m going to go on I’ll check the envelopes are in the right order in my pocket so when I pull them out they’re the right way round. I’ll check them in the dressing room and they’re fine, I’ll check them when I get downstairs and they’re fine and, as if some fairy might have gone into my pocket and switched them around, I’ll do another check. Do you get stage fright? I don’t get stage fright but I do get excited. The feelings of nerves and excitement are the same. It’s that thing of butterflies in your stomach. I think you’re nervous about something if you don’t know what you’re doing and I think you’re excited if you know exactly what you’re doing and you want it to be the best it can be. If I haven’t rehearsed enough then I’d be nervous, but that never happens. If someone is going to pay to come and watch your show the least you can do it rehearse it and practice it to the nth degree so you know you’ve got everything covered and you can do it with your eyes shut. I rehearse for hours and hours and hours and as a result I’m always excited because I want it to be the best it can be and you get that tingling feeling. It’s not anxiety, it’s excitement. They feel the same so people get confused. It’s like when you do an exam; you’ve revised for hours and hours and you get that feeling which you think is nerves but it isn’t. It’s human nature, because you care and you want to do the best you can. Have you met any of your idols since BGT? I met Paul Daniels years before and I got to meet him again, and it’s very sad that he’s passed away. Debbie McGee does a radio show in Berkshire and I went in to chat to her after Britain’s Got Talent. Paul was there too and he was lovely. I met Sir Richard Branson, as I say, and the legendary Bruce Forsyth. When did I first meet Paul Daniels? In the magic world there are lots of conventions, including one every year in Blackpool that’s the biggest magic convention in the world. I met him there and he was mobbed by everyone. Some people wanted to say hello, some people wanted to pick his brains about a trick, others just wanted a photo if he was up for it. That was the first time I met him and later at the Magic Circle, which I’m a proud member of, I’d see him there. He loved magic so if there was something in the magic world happening he was probably there. I remember about a year ago a friend of mine put on an event in Windsor and Paul was there and I got to chat to him again. We also did a charity thing called Wand Aid and he was there too. He’ll be sadly missed. You’re also featured on the BBC’s football coverage. What’s the coolest thing about that? It’s amazing because I’m a big football fan. I don’t get starstruck but in terms of celebrity I have nothing but respect for people who are famous for having a skill or being at the top of their profession. So getting to meet some of the high-profile premier league players is awesome. What kind of reaction do you get from people in the street? When I went on Britain’s Got Talent I wondered ‘If it does work out what will people say?’ When people find out you’re a magician the first thing they say is ‘Can you show me a trick?’ so I always have something on me so I can do a trick for them. I thought after the show people would ask to see a trick but you know what, they never do. All they say is ‘You should have won’, which is lovely – but on the record I’m incredibly grateful for everything that’s happened after I came second – or they’ll ask for a photo or an autograph. I’m always happy to oblige, but no-one ever asks me to do a trick. When I met Paul Daniels for the first time the first thing I asked was ‘Can you show me a trick?’ but now it’s all about people wanting selfies. What about on social media? When you do a show like Britain’s Got Talent you’re introduced to a huge audience and some of the fans on Facebook and Twitter are very lovely in their enthusiasm and from the day I did the first audition some of them have kindly messaged me 20 times a week without fail. I try and reply to everyone if I can but [laughs] with some of them it’s probably better if I don’t because they’d be coming back with loads more messages. But it’s amazing that they take the time and think I’m worthy of their attention. It’s an honour. Will there be any unusual Jamie Raven merchandise on the tour? Nothing unusual, just the usual stuff like DVDs where you can learn some of the tricks that have inspired me. [Laughs] We’ll have a think. You’ve sparked something there. Perhaps we could have mugs that change colour or a playing card mug where you drink the tea and a card magically appears on the mug. Are you looking forward to kicking off your debut UK tour in Cardiff? Cardiff’s great because I went to university in Bath and I used to get the train over for a night out when I was 17, 18 and 19. I had some great times there.